October 31, 2016, 12:06 PM · In an effort to promote the coverage of live violin performance, Violinist.com each week presents links to reviews of notable concerts and recitals around the world. 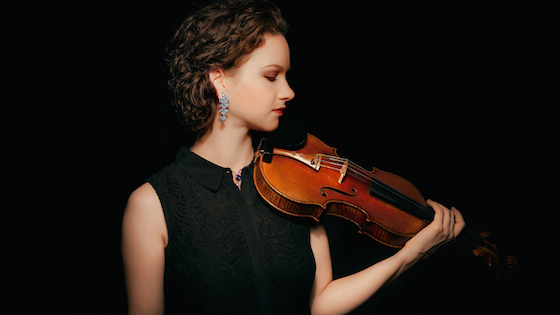 Hilary Hahn premiered a solo violin partita by Antón García Abril and performed sonatas by Bach, Mozart and Schubert in recital with pianist Robert Levin. Violinist.com: "If Abril has a gift for polyphonic writing, Hahn has a gift for polyphonic playing, drawing a kaleidoscope of colors from that Vuillaume fiddle..."
Los Angeles Times: "What came out was an attractive, questioning, absorbing series of multi-stopped harmonies that allowed Hahn’s tone to bloom fully for the first time in the evening." The Washington Post: "I was not ripped from my seat, but I certainly would not mind hearing them once more. Then again, it would be hard to mind hearing Hahn, with her quiet, luminous mastery, play pretty much anything she chose." Washington Classical Review: "Hahn’s playing, an ideal mixture of intelligence, refinement, and ferocious technique, can lift up even mediocre music. With music of more potential–not to mention a more formidable partner in pianist Robert Levin–the rest of the program surpassed expectations." Hilary Hahn. Photo by Michael Patrick O'Leary. Frank Huang performed Bruch’s Violin Concerto No. 1 with the New York Philharmonic. The New York Times: "Mr. Huang’s warm, radiant sound has penetrating depth but never turns thick or seems forced. In the first movement’s somber prelude, he shaped the quizzical violin lines with affecting restraint, conveying the music’s improvisatory character." Nicola Benedetti performed the Marsalis with the National Symphony Orchestra. The Washington Post: "At bottom, it’s an exultation about sound, offering a big bath of different noises in which everyone, players and listeners, can splash. " Washington Classical Review: "The piece is burgeoning with ideas, none of which go anywhere in particular, although it runs over forty minutes in length. A firm editor is just what is needed, a critical but friendly hand to slice away about 40% of the fat." James Ehnes performed Prokofiev's Violin Concerto No. 1 with the Cleveland Orchestra. The Plain Dealer: "Ehnes is an introspective, mild-mannered performer. Whatever he eschews in showmanship, however, he makes up for in care, detail, and passion. Every note Thursday, whether stand-alone or in a series, received his close attention." The Philadelphia Inquirer: "...in the encore, all sorts of other qualities blossomed. The second movement of Prokofiev's Sonata for Solo Violin glowed. Eberle's sound moved through four or five distinct colors, and she underscored emotional points with highly developed ideas about phrasing." Baiba Skride performed the Sibelius with the Chicago Symphony Orchestra. Chicago Tribune: "Her playing had a wonderful purity, clarity and quiet to match the patience of the music, especially in the hushed soliloquy that is the slow movement. A less nervy Sibelius than one is used to hearing, then, but refreshing to ear and mind and attentively accompanied by the orchestra." Valeriy Sokolov performed the Barber with the BBC Scottish Symphony Orchestra. Herald Scotland: "Barber’s Violin Concerto (was) gloriously played with a seductive glow and some fierce intensity by Ukranian Valeriy Sokolov." Lara St. John performed the Tchaikovsky with the Okanagan Symphony Orchestra. Summerland Review: "From the sweeping melodies and technical fireworks of the first and second movements to the relentless Cossack dance-like finale, St. John effortlessly tossed off virtuosic passages with ease and panache. Both soloist and orchestra received a resounding standing ovation at the conclusion." Vernon Morning Star: "St. John’s intensely focused energy, ripping through the gamut of musical possibilities in an electrifying cadenza, garnered ecstatic applause at the end of the first movement. The third movement, segueing from the second, brought the audience to its feet, demanding more." Joshua Bell performed works by Beethoven, Brahms, Ysaÿe, Debussy, and Sarasate in recital with pianist Alessio Bax. The Telegram: "If there ever were such a post, surely Joshua Bell would be the country’s musical poet laureate. How else to describe his playing? It’s thoughtful, imaginative, and rigorously coherent." David Coucheron performed works by Vitali, Leclair and Chausson in a chamber music recital. ArtsATL: "As fellow violinists, Coucheron and Kim seem to be of compatible musical minds, playing engagingly as a duo in this attractive, if rather ordinary, French Baroque (Leclair) sonata." November 1, 2016 at 07:26 AM · Where did Hahn perform? November 1, 2016 at 11:31 AM · Los Angeles, then Washington DC. Then this week Seattle and Chicago. Busy schedule! November 2, 2016 at 04:41 AM · Just came from Hilary Hahn's Chicago concert. Her performance was very captivating. She drew in a young crowd, majority of the audience were younger than 30! She connected well with the crowd. She even kept us up-to-date with the Cubs Game 6 score! We would definitely love to have her back here.